The squared points were suggested by friends on NNGS as potential first moves for Black (after not much thought). The circled point is my own suggestion (also not based on much thought). Why would Black fill in the diamond? Charles Matthews: This is more like an endgame problem. Would one really want to play this game more than once? As Black, I would be tempted to crawl with , to see if White answered at a. White at b might in fact be better (getting ahead with a one-point jump). But it would allow Black at a to create shape defects. The pairs of points c and d might be considered as nearly miai. 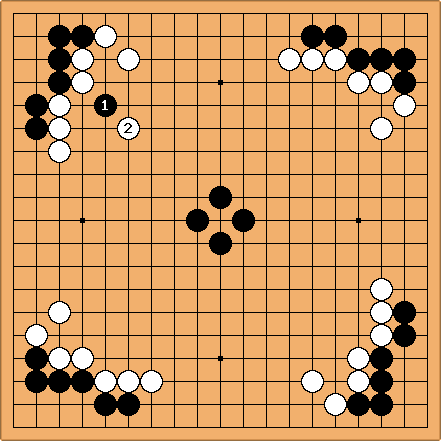 In a sense one has to wonder if Black's central group is going to become weak: if so, White can aim to combine plays like d and e to take territory upper right while attacking. here isn't polite - White should by all means play instead of connecting against the peep. Misnomer - see the diamond page.